After plenty of proofing, I’ve got some new prints available in the shop! 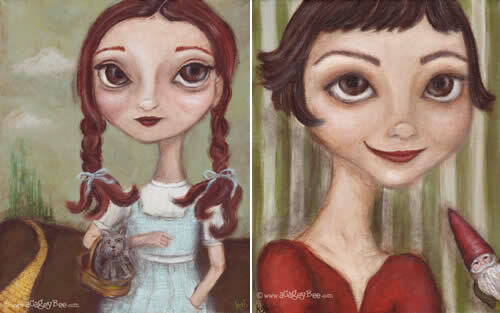 Part of my January plan to get organized includes getting my Etsy shop up to date with all of my prints and lockets and original paintings that I have available. So far I’ve only finished adding the prints, but that is a long, very dull process that I love to avoid. It can be lots of trial & error to color correct the prints to match the original paintings, all of which requires patience & good lighting. Both of which I seem to be running low on these days! “The Seamstress” started as a sketch on the loveliest textured cold press paper. As I kept working with her, I began painting in some color, drawing a looping thread-like border and finally delicate touches of gold in the Singer sewing machine details. The original work sold just a few days after I’d completed her and I have to admit I was a little sad to let her go so quickly. I’ve always admired people who have the patience and skill to sew their own clothes or stitch beautiful details into cozy quilts. I’d love to become a better seamstress myself, but my tendency to want to follow my own path instead of the directions can be a bit of a problem. A sturdy seam ripper is my best friend! 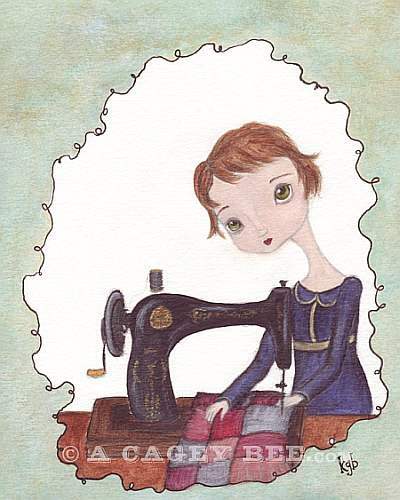 Hanging “The Seamstress” in your craft room might be just the thing to inspire wonderful new creations! 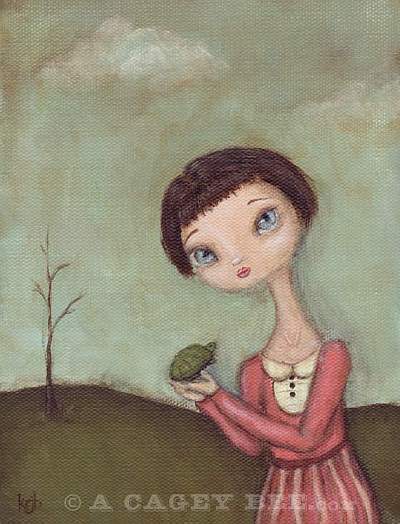 Chloe and her pet turtle, Vince, have been inseparable ever since she discovered him paddling around a rather large crystal punchbowl left on her doorstep. You can often see the happy pair out on their daily walk, making sure to stop for puddle splashing and the occasional carrot. In the evenings, Vince enjoys being read to, preferring the genres of historical biography and science fiction. Click here to see more art prints for sale. I have plenty more paintings and lockets and silver critter pendants to add to the shop, so my next task is setting out to photograph everything. We have such short hours of daylight and such cloudy overcast skies that this is proving to be a bit of a pickle. As much as I prefer natural lighting, I may just have to make do without. Or maybe book a holiday to a sunny beach somewhere instead! That counts as a tax write-off, right?